Hello! I’m Amy and I’m “just” a stay home mom (don’t you love how we all say that) with a degree in interior design. 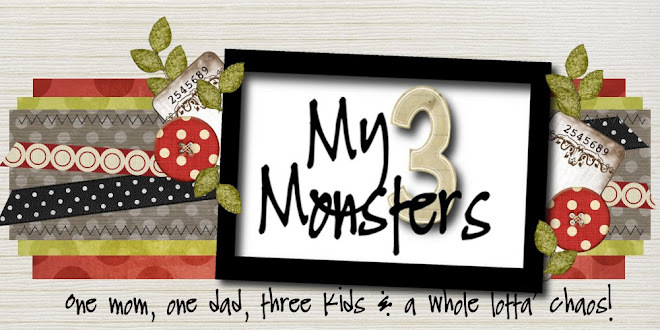 I started writing “My 3 Monsters” to chronicle the adventures of our somewhat crazy family, but it has really become a fantastic creative outlet. I craft whenever I get a chance to keep the creative juices flowing and I’m a compulsive re-decorator. While I would love to have an unlimited budget to dud up my home, I LIVE FOR a good deal. (I even bought our dog because she matched my decor and only cost $15. I know, I know . . . ) There is nothing I enjoy more than budget conscious decorating. It is my personal belief that every family should have a home that they love and is a beautiful, comfortable reflection of who they are no matter what their budget may be. Every so often I get the urge to redecorate my home. Often these urges concur with the removal of seasonal decorations. There is almost nothing like the potential of a fresh, empty canvas of a living room. So today I set out to create a piece of art for over my fireplace. Armed with some inspiration, a basic knowledge of internet investigation and a lotta’ luck, I happened upon the Flickr photostream of Leo Reynolds. 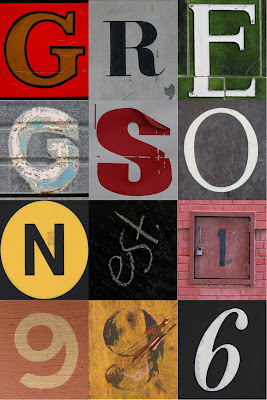 He has posted thousands of photos of typography and signage (and other interesting things) and he is kind enough to let us, the general public, use them with a very few restrictions. Well along with Thanking Mr. Reynolds ~ Thank You Amy for sharing this with us all. Thanks again Amy for sharing this awesome idea! I’ll be back later on tonight with The Sunday Showcase Party post! Enjoy! While I had other criteria a dog had to meet before one could come home with me, it was his coat that sealed the deal as well! Glad to know I’m not the only one that crazy! Great project! One more to add to my ever growing list 🙂 Thanks Mr.Reynolds, Amy, and Stephanie-Lynn! oh my goodness! I love this… I immediately went over to Mr. Reynolds site and got some pictures. It’s printing as of right now… 🙂 Thanks so much for sharing this. What a great idea! How about doing one of those free 8×10 canvases with the photo? WOW! I love this!! Gorgeous!! I like this! I have extra random letters in different fonts from scrapbooking that I bet I could put together to make a gift for someone. I could make it all aout of scrapbook supplies and distress as needed. I fell in love with this too! So cute and creative. 🙂 I love the way yours turned out – with that large white mat – really shows off the design. That is super cool wall art. Great artists. This sounds like a fun family activity. Thanks for sharing! Thank you for sharing! I’ve been looking for a creative change of address photo. My original idea was to hold signs with our new address but my hubby didn’t like that idea. This is great! I hope by passing it on, others will be inspired too! I love it!! What a great idea…it really looks like a super-classy piece of art that you paid oodles of money for! I swear. You’re a genius. What else can be said? I LOVE this! Awesome!! I’ve done 3 so far. Doing a post on them today and linking back to you. This is great. I am featuring it over at somedaycrafts.blogspot. today because it got the most views in Whatever Goes Wednesday. I’ll have to admit what initially grabbed my attention was the similarities in our last names! But such a great idea. I’m not a crafter but I’m going to try to get my daughter to do this for me. I have a brand new nephew who has spent most of his time in a hospital… I would LOVE for the new mommy to come home to this surprise… where did you find the @ pic or the est. pic on the chalkboards? I’m not having much luck with those two. Thanks for an AWESOME project!!! I MUST get off this website and get some stuff done but I.can’t.stop.reading. So many good ideas…so little time. i have GOT to do this one! We just repainted our living room & I have been wanting to change up the decor in there. This project is PERFECT!!! Thanks so much for sharing it! I followed you over from Word From the White’s. So excited to see all your DIY projects! I LOVE this! I aleady made and framed mine. My husband even said hte thought it looked good! How to you stitch this in gimp, or combined each picture or letter to make it a picture? I really need help. So glad I cam across this today. I’ve already made one of my own. Thanks! Thanks so much for this idea! We’re getting ready to celebrate our 15th year anniversary and I just made one for my husband! I chose letters that meant something from our lives. Italian tiles from when we lived in Italy. Metal welded and cut to remember we met in welding school. Chili pepper cuz he loves spicy foods and even one was quilted for my love of crafts! Absolutely love this! Getting started on this tonight for our entry. If it’s as easy as you say, this could make AMAZING christmas gifts. Found this site somehow because i would LOVE to make this..came to your page and saw OUR last name in your picture! Not many Gregson’s out there! I tried to send you an e-mail to your Contact link ([email protected]) above. It was returned as undeliverable. Do you have another e-mail address I could use. LOVE LOVE LOVE this idea – I’ve downloaded all my letters but I really want an “est” I can’t find it anywhere on Mr Reynold’s stream – would you mind sharing where you found your est at? Could someone please email and explain how you got it to work using gimp i am having a really hard time and want to make one for my baby room? My email is [email protected] thanks! Could you explain a little more how to came to put all the letters together? I have them downloaded, but have no idea how to “stitch” them together. I really want to make this!!! I think this would make a great gift. I’m going to put this in my idea book for next Christmas. Thanks for sharing. Love it. Unfortunately can’t figure out how to get the pics off of flicker and onto my computer. Please explain. I can’t wait to display this in our new home! I’m also struggling to locate the “est” on Mr. Reynolds website. Can you send me directions please? Thanks so much! HI! I too am wondering how you found the “est.” or the “@” on his flickr stream. Also would LOVE more instruction on Gimp! LOVE,LOVE,LOVE everything I’ve seen on your site! I’m trying to make my own word wall art. I downloaded GIMP and have been able to transfer the letters to GIMP but don’t know how to get them on the same document. Please help! I also would like to know where you found “est”. I cant figure out how to get them off flicker and onto my computer? and can someone explain the gimp to me? Thanks so much! Yes where did you find the “est”? It’s driving me nuts trying to find one and I don’t want to do the individual letters! I’m lazy i guess. :)Thanks! Love your idea! I, too, am curious where you found the “est.” With our long last name, spelling out “est” seems like too much. Thanks for sharing your work! 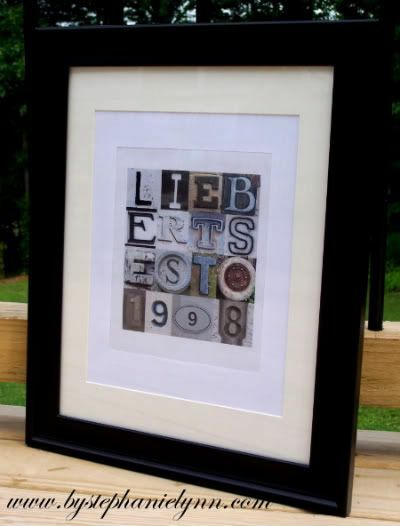 This is an awesome project, I saw a print in a magazine were they used just the 1 letter like a monogram I thought it would make a cute gift for an expectant mother… I can’t wait to try this! For the “est” i just searched images in flikr and found one that showed the whole word “Established”, then I cropped just the “Est.” It worked great. My only issue right now is that when I sent my project to the printer, the preview shows the sides cut off. I want an 11×14 print, so I sized my GIMP file to 1265×1610, as suggested. Any advice?? I’m so close to being done! Ok, seriously, this is the best!!! I have to do it, maybe for my kids for their homes at Christmas time.